This couple had reached a love-it-or-list-it moment. The rambling ranch they’d lived in for more than a dozen years was located near the beach, great shops and the horse barn property where she rides show jumpers. It had a generous lot and was the first home they’d ever bought, right after their wedding in 2000. Both homeowners loved the way its one-floor living lent itself to Southern California’s indoor-outdoor lifestyle, and they weren’t anxious to move on or find anything fancier. However, their lifestyle had changed, and if they were to continue loving their home, it needed to get a refresh. Both of them were working from home and wanted more room to move around. The expansion included a laundry room, a library, a powder room, a dining room and a third garage stall — all while maintaining a casual ranchy feel. Who lives here: A couple who works from home, with their 2 dogs. She loves to ride show jumper horses nearby. When they hired architect Rick Bokal, the homeowners implored him to keep the simple, comfortable, ranchy feeling they loved so much. They just wanted their house to be “the best little ranch house it could be,” they told him. One question stumping them was how to incorporate the red Viking stove they’d fallen in love with, so they hired Anne Sneed Architectural Interiors to help them finish the kitchen. Before they knew it, the designers were helping them give the entire house a refresh to make it comfortable, warm and timeless, with continuity from room to room. 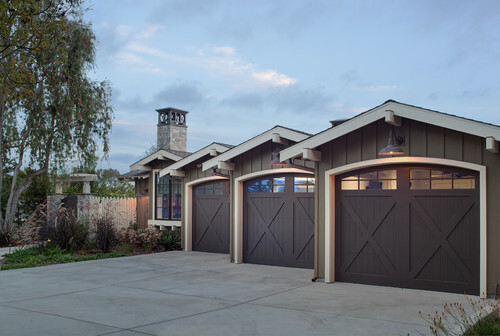 They expanded their two-car garage into a three-car garage. The barn-inspired X-detail on the doors and the board and batten siding foreshadow what’s inside. Barn- and horse-ranch-inspired details continue throughout the house. The galley kitchen’s dimensions were expanded just a bit during the renovations. “These homeowners were so great, and they had a lot of input,” Sneed says. One of them looked tirelessly to find just the right stain to finish off the white oak they used throughout the house, seen here on the hutch-like cabinets. The couple had already placed a table at the far end of the space, and the design team suggested adding the reclaimed-wood banquette. 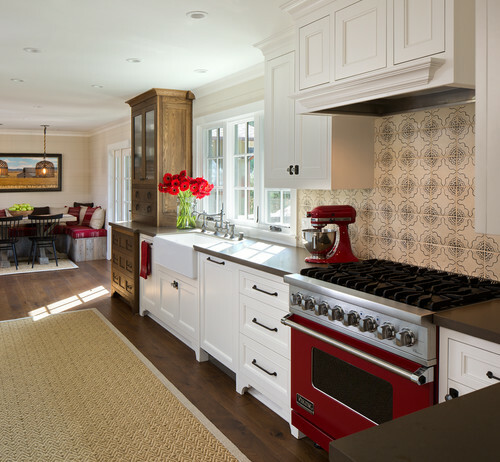 The hand-painted custom tile reinforces the red range as a focal point. It is a hand-painted terra-cotta tile customized for this project. The hardware is bronze. “It has a very nice weight to it,” Sneed says. The wood stain the homeowner found is best viewed here, at the end of the kitchen. “We wanted to create a nice transition between the galley kitchen and the breakfast nook and break up the length,” Sneed says. Two hutch-style white oak cabinets fit the bill. The one on the right conceals small appliances, like the toaster and coffee maker, which keeps the limited counter space uncluttered for more workspace. The one on the left contains everyday dishes and glassware, conveniently located next to the dishwasher. Back to that special stain found by the homeowner: It gives the white oak a warm matte finish. The wood was first treated with Rubio Monocoat Fumed, then with a coat of Rubio Monocoat Pure Oil. They used the same treatment on the library shelves, hall cabinets and master bathroom vanity, creating continuity throughout the house. The breakfast nook has a casual look, thanks to reclaimed wood used on the bench, cage-like pendant lights and upholstery in red (the favorite color of one of the homeowners). An equestrian-inspired modern barn look has been carried throughout the house. The stone fireplace, metal base of the console table and reclaimed-wood mantel also add to the casual horse-ranch style, while the drywall makes the look more modern. A heavy steel bar to the right is well placed for entertaining. The homeowners keep homegrown kumquats on the bar for their special house cocktail, a kumquat whisky sour. A dining room occupies the space between the living room and the new library; a large barn door separates the two. 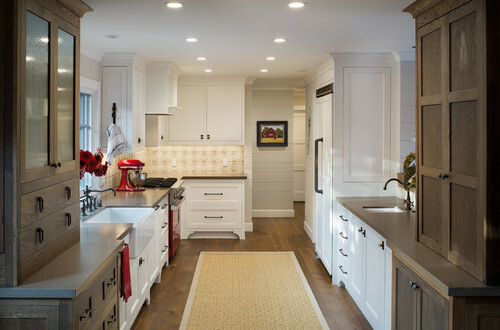 The paneling on the left is painted pine shiplap. “This is where they love to visit with friends and family, so we gave them really big chairs that they’ll be comfortable in for three to four hours at a time,” Sneed says. Flipping the usual model of host and hostess armchairs plus side chairs, they placed four leather armchairs down the sides of the table. Tip: Your dining room ceiling may be asking for more light. “Most people would usually hang one of these fixtures in the center, when what they really need is two of them,” Sneed says. The new library is a bit of a man cave. A cushy sectional wraps the corner, creating a comfortable seating area for watching television. The ancestors of one of the owners were some of the original settlers of Utah; items on the shelves include old land registers and family photos. 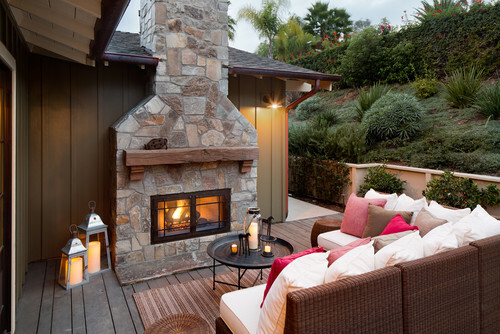 The fireplace in this second outdoor living room uses the same chimney as the one in the library for the outdoor fireplace. All of the fireplace mantels are reclaimed beams. The homeowners already had the comfortable outdoor sectional; the designers punched it up with colorful throw pillows, continuing the use of red out here.